A Seattle Times Best Crime Novel of 2017! Nominated for the Agatha, Macavity and Left Coast Crime Awards for Best Historical Mystery! "Patrick’s sassy second series novel takes the reader on an exhilarating ride through Hollywood in its heyday ... Real-life celebrities such as Billy Wilder, Dorothy Parker, Errol Flynn, Jack Benny, and George Burns populate this meticulously researched book, in which the most outlandish incidents are verifiably true. Lovers of old movies, fabulous gowns, and historical gossip will be enchanted." "Reach for the popcorn ... as much fun as a Saturday matinee at the long lost Bijou ... A brightly written tale of how Hollywood simmered while Atlanta, or at least David Selznick's simulation of it, burned." "Jaunty and delightful ... The authors are cheerfully shameless name-droppers, beginning with Marlene Dietrich ... Other celebs dropping in, all deftly portrayed, include Jack Benny, Dorothy Parker, Errol Flynn and George Burns (sans Gracie, alas). Crime, espionage, fashion and the movies — what’s not to like?" "Four stars. Patrick's book is a perfect blend of Hollywood glamour, old-school intrigue, history, and even some social commentary ... impressively entertaining ... manages to put a fun and fresh twist on the historical stories we've long forgotten." "Have I got a book for you ... a new mystery novel that deliciously captures the flavor of Old Hollywood ... the combination of a fictional mystery with real Hollywood stars and celebrities is just irresistible." "5/5 stars. There is something incredibly soothing about the Lillian Frost and Edith Head novels. They draw you in to 1930s Hollywood, seamlessly blending fact and fiction ... Lillian Frost is an indelible character." "The mystery is suspenseful, but as in the first outing, the strength of the story is in its characters and atmosphere." "Fun all around, whether you are a fan of Hollywood's Golden Age or not." "A mystery for those who think that cocktails, and conversation, should sparkle ... 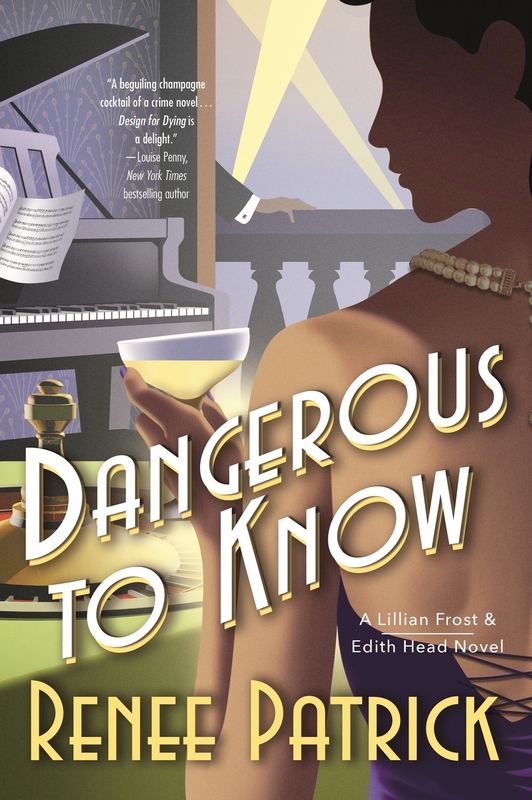 Dangerous to Know is an immensely entertaining book, cleverly written and with enough surprises to keep you on your toes ... full of fabulous zingers, the sort of witty asides you might expect from an in-the-know party guest at a glamorous affair." "... like the first novel, it’s a terrific, fun read." "The story is intricate and surprising, and the partnership between Head and her good friend Frost sets the stage for many further adventures."